Iceberg lettuce topped with house made blue cheese, onions, tomatoes and bacon. Iceberg and mixed greens, tomatoes, eggs, cheese, red onion, avocado slices, bacon and grilled chicken. Mixed greens, beets, goat cheese, toasted almonds with a balsamic glaze. 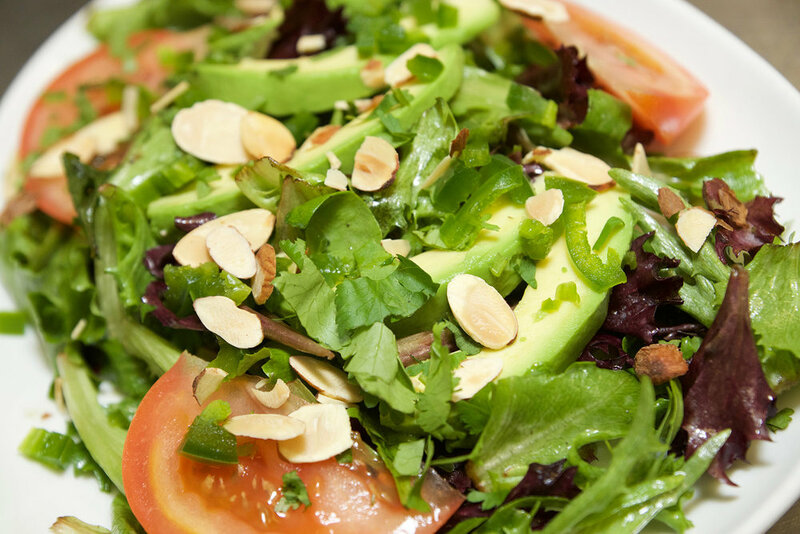 mixed baby greens, cherry tomatoes, avocado, cilantro, jalapeños and toasted almonds. Mixed with a mustard vinaigrette. Iceberg and mixed greens, pico de gallo, roasted corn, black beans, cilantro, cheddar cheese, crispy tortilla chips and grilled Fajita steak. Served with a chipotle southwest dressing. Large fried flour tortilla filled with lettuce, sautéed peppers and onions, cheese, tomatoes, sour cream, guacamole and your choice of Fajita beef or chicken.